Rising advancements in manufacturing applications coupled with increasing demand for automation solutions across the country are driving the demand for servo motors and drives in India. Further, adoption of energy-efficient standards and increasing demand for higher productivity would further fuel the India servo motors and drives market forecast period revenues. According to 6Wresearch, India servo motors and drives market size is projected to grow at a CAGR of 9.2% during 2017-23. In terms of market revenues, AC servo motors and drives segment captured major share of the market. Further, during the forecast period, linear servo motors segment is expected to register highest growth on account of rising implementation of straight line motion solutions across various applications. In 2016, the Computerized Numerical Controllers (CNC) application accounted for the largest India servo motors and drives market share in the country followed by motion control application. Some of the major companies in India Servo Motors and Drives market includes Panasonic, Delta Electronics, Fuji Electric, Mitsubishi Electric, ABB, Schneider Electric, Bosch Rexroth, Siemens, and Rockwell Automation. 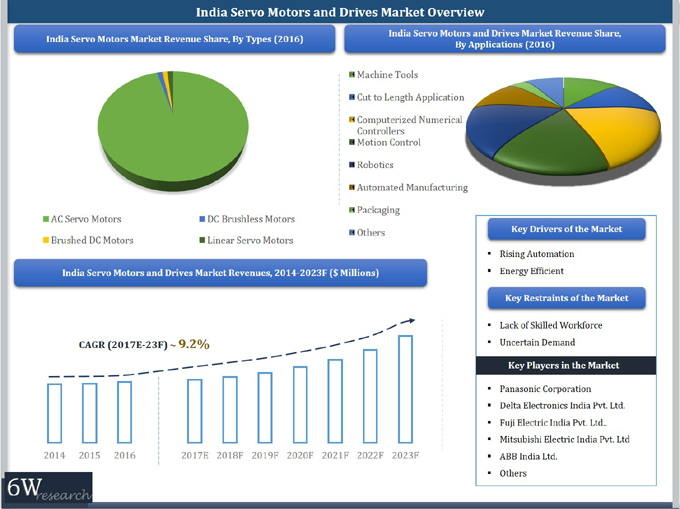 The India servo motors and drives market report thoroughly covers the India Servo Motors and Drives market by servo motors and drives types, communication protocol, voltage range and applications. The India servo motors and drives market outlook report provides an unbiased and detailed analysis of the India servo motors and drives market trends, opportunities high growth areas, market drivers which would help the stakeholders to device and align their market strategies according to the current and future market dynamics. 13.2	Delta Electronics India Pvt. Ltd.
13.3	Fuji Electric India Pvt. Ltd.
13.6	Schneider Electric India Pvt. Ltd.
13.7	Bosch Rexroth India Pvt. Ltd.
13.9	Rockwell Automation India Pvt. Ltd.